During the last few days my Celtic Angel has started to take flight and will soon be released. I have been working on her to give you as many possible options and choices as you create the perfect angel to match your Christmas colour scheme. 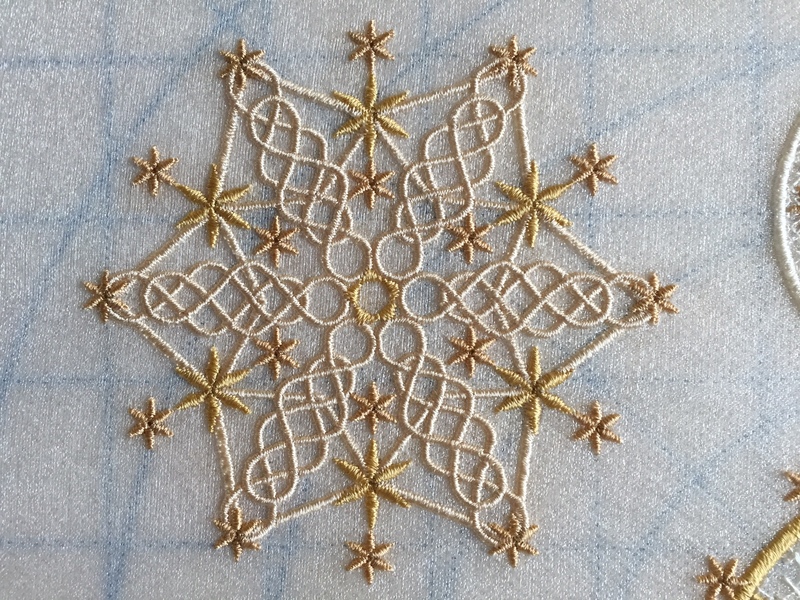 I have introduced some other little items to compliment her and here you see the first stitch out of my Celtic Snowflake. I have successfully stitched the skirt panels out on silk dupion as seen here, although I need to add the option to do the scalloped edges in hoop rather than cutting around them afterwards which really doesn’t work as silk frays so much. Hope you like the green gold colour scheme I have chosen. This skirt will be sewn together and used to create my special angel for the top of the tree. Here is a stitch out of the upper section of my Angel on polyester shimmer organza using wash away stabliser. I have chosen colours to compliment the baubles on my tree. 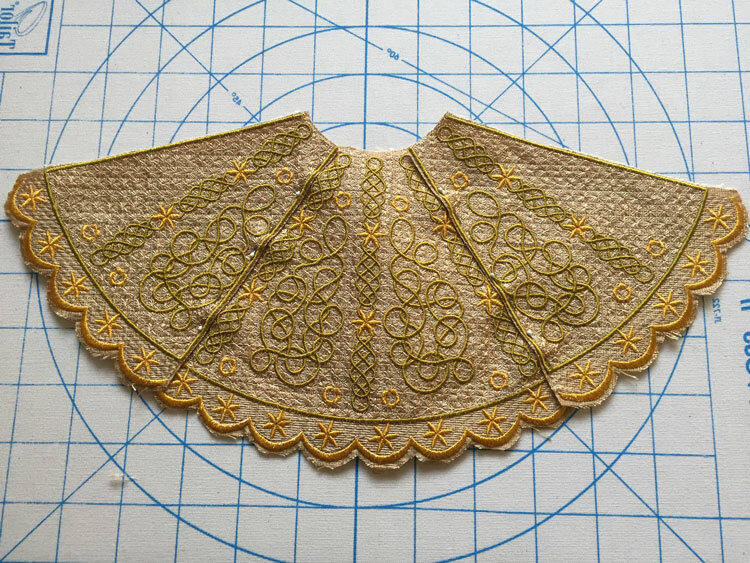 These make lovely lace decorations which do not take long to stitch out. I experimented at trying to get 2 in my favourite 8″ by 8″ hoop but was unsuccessful. It is important to keep trimming your threads underneath as you stitch her out. I am sure that you will think of other uses for this angel around your home. Attach one to the ribbons of that very special gift as you wrap it up but do remember some hot fix crystals to give a little more bling! 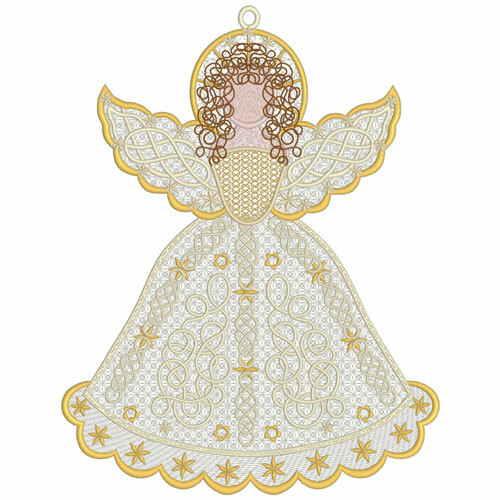 This is the finished flat version of the angel with a loop to hang her on your Christmas tree. 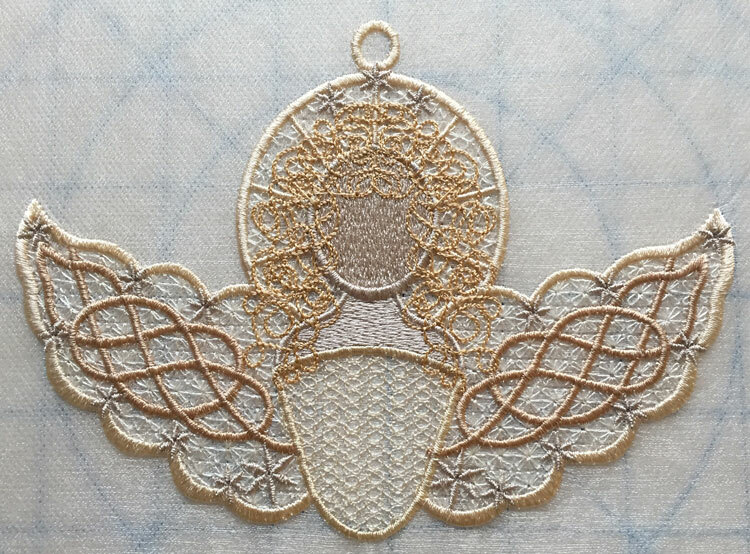 If you would like to pre order this Celtic Angel which will be released later this week, you need to be a member of my Embroidery group and have your account at Graceful Embroidery approved to enter the Members area. Join now and get all the privileges and benefits of the group. Next time I will show you how I construct the angel to sit on top of my tree, using the sections of skirt and the inner support, along with some other ideas of making your angel unique. Later this month I introduce a special freebie for all those who follow my blog this Christmas. This entry was posted in Discussing machine embroidery, Embroidery projects, New Designs and tagged Celtic Designs, Christmas, embroidery on silk, machine embroidery, Snowflakes, wash away stabiliser. Bookmark the permalink. Your Celtic Christmas angel is simply exquisite! I must have her! And I so hope to find a little window sometime this season to make her to hang on my tree! She is everything I hoped for and more. I can’t wait to stitch her out. Thank you. Thank you Margaret. You had better take another look as I have just added another set of wings! Well done, it is very pretty. I especially like the scalloped edges. They finish it off nicely. You can create a yahoo email account just to join. Then change the settings and use your existing email address to receive all postings etc. Let me know if you need further help. Please join the groom as I am sure you will not be disappointed. There are many benefits and lots of freebies. The angel is beautiful and would a great finishing touch to any tree! Once we’ve created an account and joined the group, is there a special link or place to preorder? She is so beautiful, I can’t wait to stitch her out! When you join my group you have to ask your account to be given access to the Members area, so you can make pre orders. I will definitely figure out a way to stitch at least 1 angel this Christmas – even if I have to hide out from Santa on the Christmas eve!! She is exquisite Hazel.